Mostly Positive (22) - 72% of the 22 user reviews in the last 30 days are positive. Mixed (381) - 48% of the 381 user reviews for this game are positive. The beta branch has been updated with the build 1.512, adding nine bugfixes and two other changes. - Power Infrastructure’s (194) action could be greyed out despite the necessary resources being available. - Mining Rights (067) and Mining Area (064) were missing production icons when using Robotic Workforce (086). - Helion could fall into negative MegaCredits when attempting to buy Standard Projects using Heat with no MegaCredits. - User playing as Helion was unable to use Heat to buy cards with certain actions. - In very rare cases, two winners were wrongly declared at the end of a game despite different final scores. - The player tray remained on an opponent if they gained resources during the user's turn. - Terraform rating continued to increase when performing actions which would increase an already maxed-out global parameter with Regolith Eaters (033). - The action of Search for Life (005) revealed the card only to the player using it. - "Ranking" was wrongly mentioned twice in the player's profile. - The amount of game seeds involved in the creation of game sessions increased from 999 to 2,147,483,647. - The in-game credits now contain the names of users who actively participated in the previous beta tests. Please let us know in the pinned thread Beta branch feedback - build 1.512 and following if you experience any issue. In the Library tab of your Steam client, browse the left-side list and right-click on Terraforming Mars. Select Properties. In the new window, visit the Betas tab. 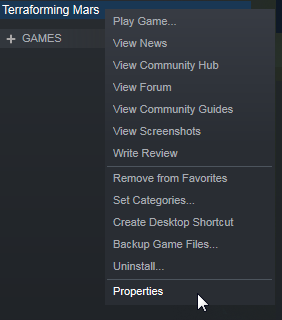 In the drop-down menu, select betatest - Patch beta test and close the window. Steam will download the update. Make sure that you check all files have been deleted, some of them are set as “hidden” and will need to be revealed to be deleted. This beta test is limited in its duration. If no serious offenders are reported, the content of the beta will be pushed to the live branch. 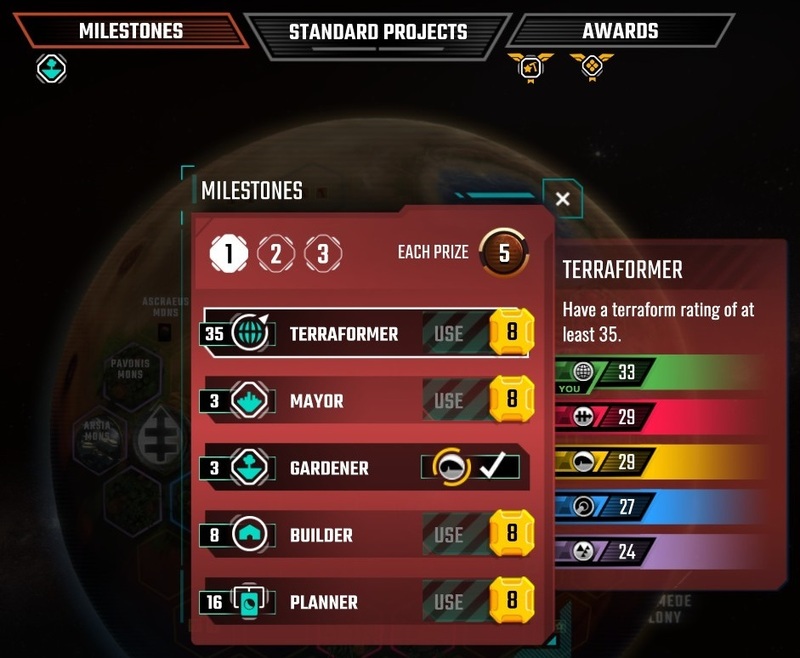 The first major update for Terraforming Mars is now officially available! Read below to discover the new content and the bugfixes. After the Solo Challenge and the Corporate Era, the third official variant is now implemented and available as an option for local and online games. It allows players to affect which cards other players get access to, and increases your ability to pursue a certain strategy, or predict which parameter will rise first. During the Research phase each player drafts four cards to buy from instead of just drawing four to buy from. Each player first gets four cards and chooses one to draft and put aside. Each player then passes the three other cards to the following player. You now set aside one of them and pass the rest to the left. You repeat this until all cards drawn have been drafted. You now examine the four cards you’ve set aside (drafted) and choose which to buy (3 M€ each) and which to discard. Drafting is not used during the first generation since the first Research phase is skipped. The Draft Variant adds some extra game time and isn't recommended for players new to Terraforming Mars. This new feature, available at any step of the game, allows you to pause your current action and check the information you need before making your decision. For instance, you're at the end of the Research phase and need to select which cards to buy. Simply press the button View game state to switch to the main screen, view the surface of Mars and open any window you need (your Tags for instance). A mouseover on any Award or Milestone will display the compared performance of all players. The Tutorials are now available in the Main Menu instead of the Options menu. All blocker bugs and a large number of rule-breaking issues have been addressed. We will continue ironing out the game and monitoring the forum for your reports in the next months. We'd like to thank our beta-testers who have provided valuable feedback over the winter. They'll be listed in the game's Credits in the next patches. The fixes included in this build include: AI freezes, online desynch, awards calculation, blue cards exploits, negative productions, corporation-specific issues, and card-specific issue such as Search For Life (005), Capital City (008), Noctis City (017), Phobos Space Haven (021), Arctic Algae (023), Predators (024), Optimal Aerobraking (031), Nitrogen-Rich Asteroid (037), Virus (050), Land Claim (066), Advanced Alloys (071), Mars University (073), Viral Enhancers (074), Ganymede Colony (081), Robotic Workforce (086), Research (090), Extreme-Cold Fungus (134), Herbivores (147), Pets (172), Livestock (184), Rad-Suits (186). - The action of Search for Life (005) reveals the card only to the player using it. - User playing as Helion is unable to use Heat to buy cards with certain actions. - Helion can fall into negative megacredits when attempting to buy Standard Projects using Heat with no MC. - The player tray can remain focused on the opponent if they gain resources during the user's turn. - In very rare cases, two winners are wrongly declared at the end of a game despite different final scores. Draft variant available: Add a new level of strategy and depth by choosing your best cards and blocking your opponents. During the Research Phase, start by drawing 4 cards, choose one and pass the others to the next player. Continue to choose a card and pass the rest on until all cards drawn have been drafted. Which card will you choose? Will you block your opponent from getting a card, or choose one that fits your strategy best?